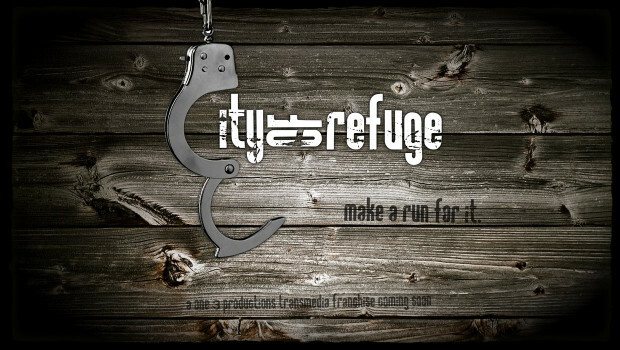 City of Refuge is an ambitious transmedia project about a fictional small town that serves as an alternative to prison, where criminals are reformed and safe from law-enforcement. But if they leave the town, they risk being chased down by bounty hunters. I interviewed producer Houston Howard about City of Refuge. @ThisIsTM: The scope of what you’re to accomplish covers everything from a feature film, comic book series, music album, board game, and more. What’s the biggest challenge you’ve had trying to balance the production of so many story elements? @ThisIsTM: One way you’re trying to get people involved is to have your audience create and submit their own videos, stories, artwork, etc. Since the project hasn’t been released yet, how do you go about focusing this crowdsourced creativity? One approach that we’ve taken is getting the fans excited about being a part of the development process themselves. So often, fan fiction and fan-generated content isn’t taken seriously or, at best, is viewed as an afterthought – the fans getting the leftovers and the breadcrumbs after the adults are finished with the main course. We want the fans to understand that by generating content within the parameters of our storyworld early in the development process, their content can actually impact other stories within the sandbox and help shape the creative storyworld itself. Most producers mistakenly think that the development stage of a project limits fan involvement, but actually, with the right approach, it can be very empowering to the fan community. @ThisIsTM: You’re planning a series of comic books focused on bounty hunter characters in the story. How did you choose these particular characters for the comics books? The Bounty Hunter series actually developed pretty organically out of the storyworld itself. The City of Refuge universe, is centered on the concept of a legally sanctioned sanctuary town for criminals – if criminals can make it to this small, backwoods, country town before the police catch them, they can live freely. If they step foot outside the town, they can be captured and prosecuted for their original crime. In order to make that work, we had to create a legislative “halo” around the town, stipulating that unless the police are in direct pursuit of a suspect, they have to stay at least one mile away from the town line (if not, the cops could just surround the town and catch everyone trying to come in). From there, we thought it would be cool if there was a character who lived and operated in this “wild west zone” between the cops and the town itself who (since the cops are limited) takes it upon himself to “police” this area, capture anyone trying to flee into the town and turn them over to the cops. This character started as just a single, supporting character for the film; however, when we develop characters for transmedia properties, we develop each one like they’re the protagonist of their own stories. We do this because…well…they very well could end up being a protagonist in a correlating story. Initially, in order to engineer more points of view, we also think of characters as people groups rather than as individuals. So, instead of just looking at a single homicide detective, we look at cops in general. Instead of looking at Harry Potter, we look at wizard students as a whole. This approach took us from our single bounty hunter to a whole group of bounty hunters which ended up being a very eclectic, interesting group to explore. @ThisIsTM: What’s your collaboration process like working with a comic artist? The creative team, as a whole, develops stories to be platform-agnostic and after the stories are broken make the decision as to what medium in which to port them. On our creative team, we have a comic writer, who looks at the story we select for the comic series and then begins to tailor it to fit and maximize the unique aspect of the medium. He takes the story treatments and begins writing the scripts for the issues with the panel descriptions and notes for the artist. When the scripts have been revised, we then pull in an artist to facilitate the penciling, inking and lettering with our comic writer being the project manager. We try to do as much as we can in-house, so in that way, the collaboration with our “comic guy” is very smooth. @ThisIsTM: You started producing City of Refuge in 2011. What’s one thing you’ve learned about producing transmedia that you’d wish you’d known from the start? When we started the development process of this project, we really didn’t have a fully, fleshed-out creative design process in place. Instead, we used this project as the means to develop a scalable, replicable creative process that can optimize a transmedia story. We’ve since done that and actually are publishing a book that teaches the process – Make Your Story Really Stinkin’ Big: How to Go From Concept to Franchise and Make Your Story Last for Generations (Michael Wiese Publishing – in book stores in a couple of months). If we would have have that process from the start, we could have launched much quicker out of the box. Instead, City of Refuge has taken some lumps that necessarily come from trial and error. @ThisIsTM: The theme of City of Refuge is “no one is too bad for redemption.” Would you consider it a faith-based transmedia project? If so, how do you think transmedia helps communicate with a faith-based audience? I definitely wouldn’t want to label City of Refuge as strictly a “faith-based project” simply because the industry connotation attached to that term necessarily implies that you mean to limit your intended demographic and I don’t believe we’ve done that. This is a mainstream project with a mainstream story. It’s big, it’s fun, it’s action-packed. That being said, our company refuses to tell stories that don’t have strong themes. We start every project by saying, “What does the our culture need to see right now?” “What is the best advice we could give our best friends?” Once we’ve answered those questions, we thing figure out how to dramatize it. People need to know that their lives aren’t over just because they’ve done bad things in their past. It’s Darth Vader’s story. It’s Boromir’s story. And it’s a simple truth that transcends demographics. Will secular folks love CoR? Definitely. Will faith-based audiences love it? Definitely. Do we ever preach at anyone? Never…and by “never” I mean never ever ever. A story isn’t meant for preaching. It’s only meant to entertain, engage people’s emotions and be a catalyst for future open dialogue. @ThisIsTM: Transmedia projects can be difficult to explain. How would you describe City of Refuge to someone in line at the grocery store? I always, always, always talk about the story before the model. Once I hook them with the concept of the story, they’re now open to hearing about how we’re going to creative produce the content. If I lead with the transmedia model, I get the deer-in-the-headlights, “this is over my head” look nine times our of ten and I’ve pretty much lost my audience. PERSON: You’re a producer? Cool! What kind of projects are you working on? ME: I’m currently developing a project called City of Refuge. It’s about a small, backwoods country town that becomes a sanctuary city for big city criminals. If a criminal can make it to the town before being nabbed by the cops, he can live their freely but if he leaves, he can be caught and prosecuted for his original crime. So, you have all these nasty, nefarious worst-of-the-worst criminals living in this quirky, small eclectic holler community. PERSON: Wow, that’s sounds cool! ME: Thanks! You can see how there’s tons of story potential there. That’s why we’re simultaneously producing a feature film, a comic series, a novel, a game and an album that all tell different stories within the City of Refuge universe and all work together to tell one, big story.